';Kanar's debut novel is an imaginative page-turner. . . . 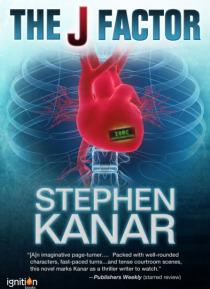 Packed with well-rounded characters, fast-paced turns, complex and bizarre medical practices, several subplots and tense courtroom scenes, this novel marks Kanar as a thriller writer to watch. '-Publishers Weekly (starred review)Welcome to the future, when organ transplants have become commonplace, and replacement organs are allocated accor… ding to a system that quantifies everyone's conduct, health, and importance to society based on a point system: a Justification-or J-Factor. David West, a new heart surgeon, inadvertently performs an unauthorized transplant on his patient . . . who is then murdered. Could it really be to protect the International Organ Replacement Corporation's worldwide monopoly? Is this powerful corporation-so powerful it has treaties with every nation-really deciding who lives and who dies? On the run for his own life, West meets a young attorney, Janette Compton, and together they struggle to unravel the truth about the murder and to expose the IORC before they and hundreds of others find out just how far IORC will go to protect its monopoly.